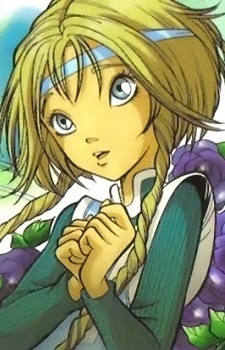 Elyon "Light of Meridian, Portrait, Brown"
Elyon is a heart-warming teenager with straw colored hair in two braids. She is friendly and smart, but sometimes a bit wishy-washy. She is the Queen of Meridian, and the Light of Meridian. Elyon was born in Meridian, lone daughter to the Queen and King and heir to the throne; however, after the disappearance of her parents, a Meridianite named Galgheita took her to Earth to evade the wrath of the cruel and heartless Phobos, her evil brother, and to protect her from him, who had plans to steal her superior magical powers. On Earth, Elyon was raised there as a normal girl by the Portraits (Browns in American version), Meridianites whom Elyon believed to be her parents. She knew nothing of Meridian or her true identity. Elyon became best friends with Cornelia Hale and good friends with the other W.I.T.C.H. members. When she met Cedric she developed a crush on him. Elyon begins going to his book store frequently and starts to help him out with the shop. Cedric eventually tells her about her identity and turns her against the Guardians convincing her to go to Meridian, where he teaches her to wield and use her powers. After staying by Phobos and Cedric's side for a while, Elyon realizes that Phobos and Cedric are after her powers and helps W.I.T.C.H. defeat them. Elyon then stays in Meridian and assumes her rightful place as the Light of Meridian. Elyon is the Light of Meridian, an exclusive savior position reserved for females of the Royal Family. The Light of Meridian is a very powerful magical force and is the rightful ruler of Meridian. According to Phobos and the Oracle, she is even stronger than Phobos himself. Elyon's full power seems to exceed or at least rival the combined strength of all five Guardians.